The big guns: two Nikon D2H digital SLR cameras, one with Tokina 12-24mm f/4, the other with a Nikkor 80-200mm f/2.8. I just finished teaching a really great group of photographers my Intro to Digital Photography class. The last session was pushed back by two weeks due to weather and the Memorial Day weekend, so we reviewed some. They liked the class so much they all signed up for Intermediate/Advanced next week. Abby makes pictures at the Oklahoma City Zoo with a so-called “superzoom,” an excellent choice for occasions like visiting zoos or parks, or other times when you want to lighten your load. In the second of the three beginner classes, I talk about, among other things, lenses, and that got them interested in buying something other than the kit lenses that came with their cameras. (Interestingly, all five of them had modern Canon cameras, and all of them had at least the 18-55mm kit lens sold with them.) At least two students expressed frustration with the utter complexity they discovered while trying to decide what lenses to buy. Real photographers, which my students almost always are, don’t have their cameras to impress other photographers. They want to make pictures. My day-to-day go-to kit includes a 12-24mm wide angle zoom and an 80-200mm zoom. This takes care of about 85% of my shooting. Always carry and shoot with two cameras, one with a very wide wide angle lens on it, the other with an f/2.8 telephoto zoom on it. 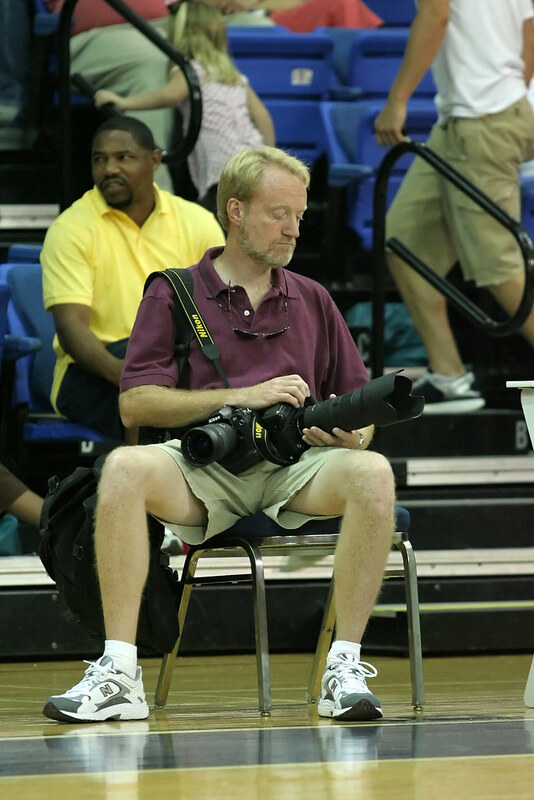 For sports, it might work to have a third camera with a bigger lens on it, like a 300mm or longer. Except for maybe a flash in a pocket, an extra battery and an extra card, leave everything else in the trunk of the car. You never need to change lenses. When you want to shoot wide, it’s one camera; when you want to shoot long, it’s the other. No camera bags, vests or pouches to get tangled up while at the same time hiding your gear in a jumble of other gear you won’t need. You can move without having to pick anything up, leaving your hands free. Shooting at London Bridge with the excellent Fuji S200EXR, which is equipped with a very versatile superzoom lens. One of my students asked me about “prime” lenses (non-zooms). This same plan applies to primes: a wide angle on one camera, a telephoto on the other. In the film days (before zooms were as prevalent or as good as they are today), the combination was often a 24mm or 28mm on one camera, and something in the neighborhood of a 180mm on the other. I know that not every situation is best covered photojournalistically. My own hiking trips are a good example, in which having fun hiking and making images that are more artistic and visionary takes priority over getting the moment covered like a blanket. Along those lines, one of my students asked me about the so-called “superzoom,” which is also known as a walkaround lens or an all-in-one lens. Abby has one, a Tamron 18-250mm, and for the kinds of things we shoot, particularly when we travel, it’s an excellent choice. Lenses in that category are also a good choice to hand to non-photographers (reporters and editors, for example), who would need to take pictures in the absence of a photographer. Examples might be during a natural disaster when all the photographers are busy, or when spaces for individuals are limited, like on a helicopter tour of a major event. You will see photojournalists all over the world work with this combination of lenses and cameras: a wide angle, a fast medium-length telephoto, and a supertelephoto for sports. Feel free to delete this comment after you’ve seen the image. All good advice. I agree that the ‘alphabet soup’ can be confusing to new photographers. They wonder how a less with *less* zoom can cost more than five times the price of the other one. I remember wondering the same thing, and buying the wrong lens to start with.